In 1962 the United States Navy began the search for an aircraft to replace their fleet of Douglas A-4 Skyhawks with aircraft that held a greater payload and range, with a special emphasis on accurate delivery of armament which would reduce the costs per target. For this a competition was launched where it was required to work on already existing airframes, also to reduce costs. Vought proposed a design based on their F-8 Crusader fighter featuring a similar configuration, but was shorter in length and with a stubbier nose. They dubbed it as the Ling-Temco-Vought A-7 ‘Corsair II’. Once put in production, it featured a head-up display (HUD) and an inertial navigation system (INS). Updated variants of the aircraft followed quickly with A-7E as the naval carrier-capable equivalent of the Air Force’s A-7D, featuring a Vought build Spey engine. It participated in close-air support missions over both North and South Vietnam, particularly proving the reliability and accuracy of the A-7E’s modern bombing and navigation system. Despite the success of the aircraft, it was only exported to Thailand, Greece and Portugal, who all received A-7E’s or aircraft partially equipped with E-variant avionics. This article is partially based on information found at wikipedia, 13th july 2015. Upon opening this large kit, we are greeted by a well filled box of materials. In total we get eleven frames and a photo-etch fret. Detail is of high quality, provided by fine recessed panel lines and very small details being represented on the parts. The plastic itself feels softer than what I’m used from Hasegawa, and reminds me a bit of the older Dragon kits (although it is distinctively different). We also get a decal sheet providing markings for two aircraft, as well as a separate sheet of paper with one of the markings displayed in color. Sadly the decal sheet has aged poorly and yellowed badly. The main sprue holds the central fuselage parts, air intake, main cockpit part, the landing gear and some other small things. The main fuselage parts feature some very nice details with the wheels wells molded directly onto them. Some of the ‘small things’ are parts that go onto the inside of the canopy, which is something that will add a nice amount of realism to the cockpit. There also are some avionics which would normally be hidden by two panels which can be displayed. Included also is a positionable air brake that goes on the bottom of the airframe. These are some nice details to leave visible on your build, maybe with one or two figurines inspecting the aircraft. Below I’ve added some imagery as colour reference for these options. The B sprue holds the central wing parts, with additional parts to fold the wings and leading wing slats and flaps. Again here we can find beautiful details like recessed panel lines and rivets. One has to note though that if the flaps are in the extended position. As they feel a bit fragile at the thinner areas the builder will have to be careful when handling them. The C sprue features the outer wing halves and their leading wing slats, the hard points and a pilot figurine divided in three parts. There is also a small little handle that goes onto the central landing gear found at the front of the aircraft, which is used to attach the aircraft to the catapult launch on the carrier deck. The attached figurine is well detailed on the upper half of the body, but from the waist down it is a little bit less detailed and suffers from flash. Luckily it is not the other way around and thus most of it will be hidden. The E sprue can best be described as a do-dat sprue. Most notably is the FLIR (forward-looking infra-red) navigational pod which were installed on upgraded models of the Corsair II by the late 1970’s. It enabled the pilot to fly night and adverse weather operations by projecting images of the terrain below directly onto the HUD found on the cockpit panel. The kit has two double sprues, the first being the F sprue holding the parts for a 300 gallon drop tank and a wheel each. The parts are divided into the top and bottom half of the tank, the third fin and the hard point needed to attach the tank to the wing. There is not much to say with about the M and L sprue, other than it holds the parts needed to build the pilot seat. The detail is fine and the parts should suffice to build a good looking ejection seat. However since the kit does not provide a decal or parts for seatbelts some aftermarket/scratchbuild ones should be added to achieve its full potential. The second double sprue in the kit is the O-sprue, holding the parts for a launching rail, many attachment points and AIM-9 Sidewinders which goes on the fuselage pylons. It must add that the launching rail is probably one of the most detailed I have ever seen in styrene form, with the same going for the Sidewinder missiles provided. The clear sprue K holds twelve parts. Two of these are the canopy parts, which means we can display the cockpit open or closed according to the wish of the builder. Also added is the lens for the FLIR podThanks to Hasegawa’s tradition of packing the clear sprue inside a plastic bag wrapped inside another bag together with the photo-etch fret, the parts are completely scratch free, even despite the age of the kit. Photo-etching is not something we see very often from Hasegawa. But appearantly they deemed it worthy to do so with this kit. I’m not entirely sure what the parts are meant to replicate, but the instructions indicate that they are to be installed on the both sides of the fuselage underneath the wings, with another styrene part placed on top of them. I have added the picture above to show what the photo-etch parts are meant to replicate. To clarify, it is the part sticking out on the fuselage underneath the wings, seen on the outer left of the first image and in the centre of the second. Aside from the typical instructions and decal sheet, we also get a color printed painting scheme for one of the provided kit markings (the same of the box art). Don’t worry however, as we do get the choice for a second set of markings as well. The only place where the kit really loses points is with the decal sheet. As with some of the older Hasegawa kits, the white parts have yellowed significantly. It isn’t that big of a problem if you did not have your mind set on the box-art’s markings. Another option is the second choice of markings, which only uses the white intake markings. While not practical you might be able to outsource from some leftover decals from another kit. If this is too much trouble or you do not have access to this option you can put your mind to rest, knowing that there is a rather sizeable aftermarket choice to pick from. Aside from the yellowed white parts, the other colors and decals are in good state and should not provide much trouble. The provided instruction sheet provided is about the size of an A4 sheet of paper. It is printed in black and white with blue highlights, which refer to points of interest within each of the 14 illustrated construction steps. 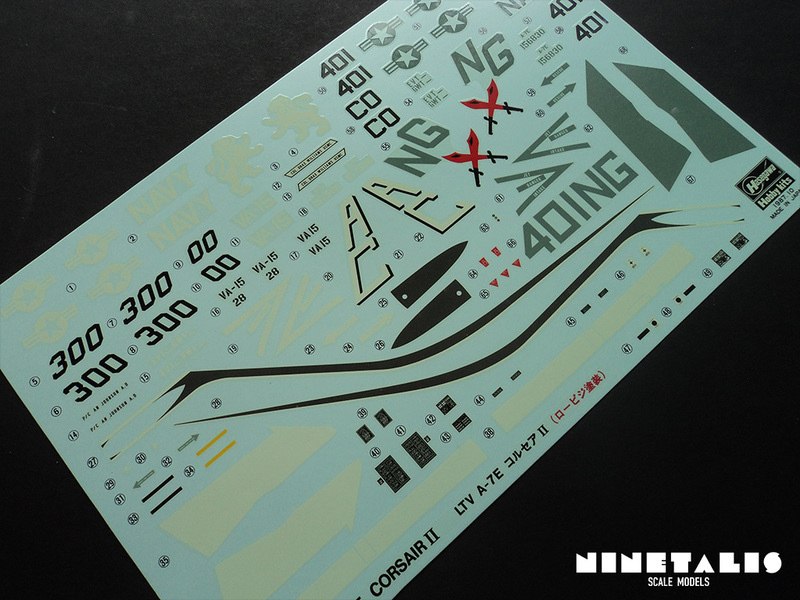 Hasegawa’s A-7E ‘Valions’ kit comes with two sets of markings. Although the kit is named for VA-15 squadron (the ‘Valions squadron’), there is only one set of markings for this squadron which is the same as that found on the box cover. While VA-15 has been one of the more active squadrons throughout US NAVY history (which you can easily find online), finding photographic evidence of the monotone grey A-7E’s in VA-15 proved a little more troublesome. I think I did manage to find one which I added below. Although the aircraft is at a small distance and shrouded in smoke, it is possible to make out the the lion found on the tail. Also notable is the patched paintwork and crudely repainted panel lines all around the fuselage. Deriving from the tail code AC, the squadron was part of CVW-3 with Cecil Field NAS as its home base. The second set of markings consist of a machine from VA-147 “Argonauts”, named after Jason and the Argonauts (a band of heroes in Greek mythology). With Leemore NAS as homebase and as part of CVW-9 at the time, the aircraft carries an NG tail code and features a seldom seen double crossed swords painted in red on the tail (opposite to the often seen single outlined sword). Throughout its excistence VA-147 has completed several deployments, many of which around S.E. Asia and the Sea of Japan. After a deployment in mid 1969 for operations off the coast of Korea, the squadron upgraded to the A-7E that September. It also performed several deployments above North and South Vietnam, and in 1977 it won the Battle “E” Award as the top Corsair squadron in the Pacific Fleet at the time. Other notable operations were an around-the-world cruise aboard USS Kitty Hawk and another deployment in the Sea of Japan in support of the 1988 Summer Olympic Games in Seoul, South Korea. On 20 July 1989 the squadron was redesignated as Strike Fighter Squadron 147 (VFA-147) and transitioned to the F/A-18C Hornet under the instruction of VFA-125. More recently, VFA-147 was selected to be the first operational squadron to transition to the F-35C in January 2018, which commenced as of August 2018. During my search for pictures of the aircraft found in the kit I stumbled upon dozens of interesting pictures showing the various stages of weathering found on these monotone A-7E aircraft. While Navy aircraft are generally well cared for, US NAVY from this era tend to range from sqeaky clean to extremely dirty. It also shows all different kinds of armament carried underneath the wings by A-7E’s of that era. When I first opened this kit, I was surprised with all the material I found within. While the Corsair II might not look like a big aircraft it is in fact a massive aircraft. Add to this that there are plentiful of additional options for external armaments. There is the absence of the huge ‘dumb bomb-loads’ which were often carried during the Vietnam war (if you wished to build one of these). Although it looks like a really nice kit, I do have the feeling that the price for these is quite steep, especially considering this is a mold from the eighties. You can always try snatching up one of the many reboxes during a clearance sale or something second hand, but then you might end up with yellowed decals like this kit here. You can also go for a newer Hobby Boss kit which is about ten bucks cheaper new, but I personally can’t say wether or not you will get a better deal or more accurate kit with those. With the large number of parts and the soft plastic I wouldn’t say this is a practical kit for a beginner, but there should be nothing here that would stop you in your tracks. but detail wise I’d definitely recommend this to anyone wishing to build a A-7E.